Independent Directions to this Site: From Highway 417 (The Queensway) take exit 138 (Eagleson/March Roads). If travelling west, the 0.6 km offramp dumps you right or north onto March Road. If driving east, a 0.5 km offramp brings you to Eagleson Road, where you will turn left or north onto it to March Road (its northward extension) and in 0.5 km join the westbound offramp traffic. Both groups will now follow March Road, or Regional 49, north, then northwest, 8.1 km to to a 90 degree lefthand turn and the junction for Dunrobin Road. Continue southwest 5.8 km on March Road to the Carp River, 0.3 km past the Old Carp Road. Because of its design as a loop tour, the instructions below read as though you have arrived at the other end of this area, 7.3 km to the northwest. Simply follow them in reverse. Dunrobin & Carp Ridges Route Directions: From the hollow that was the last sub-site mentioned in the Carp Ridge on Thomas Dolan Parkway site, continue c. 0.5 km southwest to the Carp Road (Regional Road # 5) and turn left or southeast onto it. This is a good starting point for the Carp River Floodplain area. 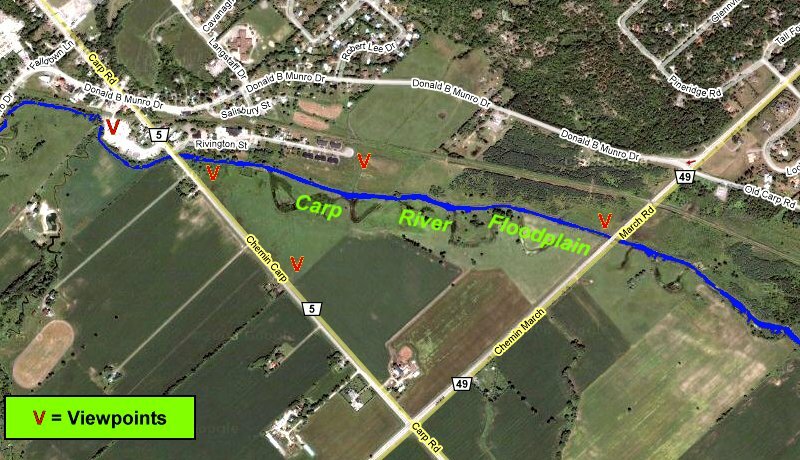 Site Description and Birding Information: Follow Carp Road southeast 4.5 km to Craig Side Road. For most of the length of this section the road parallels the Carp River closely enough that one can, with a spotting scope, check out any migrant waterfowl that may have gathered as the spring melting causes the river to overflow its banks. This section is not as subject to flooding as the area southeast of Carp, consequently is not as good birdwise, but worth a quick scan. For a quick aside from Carp Road turn right or southwest on Craig Side Road and go 1.4 km to Farmland Road. Turn left or southeast onto Farmland Road and park. Farmland Road is a very short remnant of a road improvement project and joins Craig Side Road to Donald B. Munro Drive. Scan the wires and hedgerows off both sides of Donald B. Munro Drive, Farmland Road and Craig Side Road in this area. A pair of Loggerhead Shrikes has nested here in the past. A bit of searching in the area may yield their current nest site, if they still favor the area with their presence. This species is rapidly declining in Eastern Ontario. This is the northern edge of its range. If you are lucky enough to see one, please do not disturb it in any way. And please take the time to report it to The Ontario Birds at Risk Coordinator, Long Point Bird Observatory, P.O. Box 160, Port Rowen, Ontario N0E 1M0. The area doesn't seem typical of Loggerhead Shrike habitat. 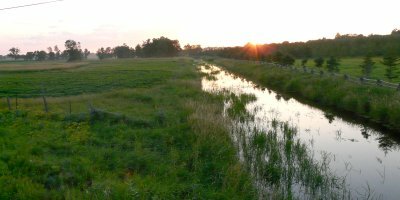 They usually prefer abandonned fields or pasture land with scrub and hedgerows. But they did nest here. Return via Craig Side Road the 1.4 km northeast to Carp Road. Follow Carp Road southeast 1.9 km through "downtown" Carp to Rivington Street, just shy of the Carp River bridge. Rivington, a deadend street only half a kilometre long, can be gone down and back in the hope of seeing a bit of the floodplain, especially from the end. Watch for migrants along the Carp River. A Blue-gray Gnatcatcher was just north of the bridge on May 1, 2005. A Great Egret was seen here May 4, 2008. A White-faced Ibis was found from here, on the floodplain, from July 4-8 and July 12-13, 2011. When you return to Carp Road, turn left or southeast onto it. Almost immediately you will reach the Carp River crossing. Just beyond the river crossing, pull over and scan eastward along the floodplain. During spring flooding, there may be hundreds of migrant waterfowl here. Migrant shorebirds may be present in small numbers as well. Canada Geese are the most abundant, with Northern Pintail, Mallard, Black Duck, Green-winged and Blue-winged Teal, American Wigeon, Wood Duck and Killdeer being fairly common. Watch for the occasional Snow Goose, Cackling Goose, Northern Shoveler, Gadwall, Hooded Merganser, Greater and Lesser Yellowlegs. Fall gatherings of waterfowl, mostly Canada Geese with the odd Snow Goose, also occur here. Seven Greater White-fronted Geese were found among them here Dec. 4, 2010; 4 seen again on Dec. 5; and 6 were present from March 21 to 24, 2011. Ross's Geese were seen here: 2 on Mar. 24, 2011 and 4 the following day. Beyond the bridge on Carp Road continue along for 1.3 km to March Road (Regional Road # 49). Stop frequently to scan, especially at first, when the river is closer. The plowed fields between the flooded areas and the road should be scanned for resting waterfowl. In winter, check the fields and roadsides in this area for Snow Buntings, Horned Larks and, possibly, Lapland Longspur. This is especially true where there has been manure spread recently. A white-phase Gyrfalcon was seen here near the junction of Carp and March Roads on January 8, 2002. Turn left or northeast onto March Road and go 1.0 km to Carp River crossing. Along the way one approaches and crosses the Carp River. There is plenty of room to pull off the side and scan, again for waterfowl and shorebirds. Some migrant raptors gather as well, perhaps watching for a meal flushed out of its home by the rising water. Red-tailed and Rough-legged Hawks and Northern Harriers are the most likely. A Great Gray Owl stopped here on Dec. 28, 2004. Dunrobin & Carp Ridges Route Directions: From the bridge over the Carp River on March Road, continue 0.3 km northeast to the Old Carp Road and turn right or southeast onto it. This is our next site, the Old Carp Road. Return to Dunrobin & Carp Ridges. Return to Birding Ottawa Table of Contents.